Another Blade is a fullgame project I've been working on from nearly 2 years now, whenever I find some spare time for it. 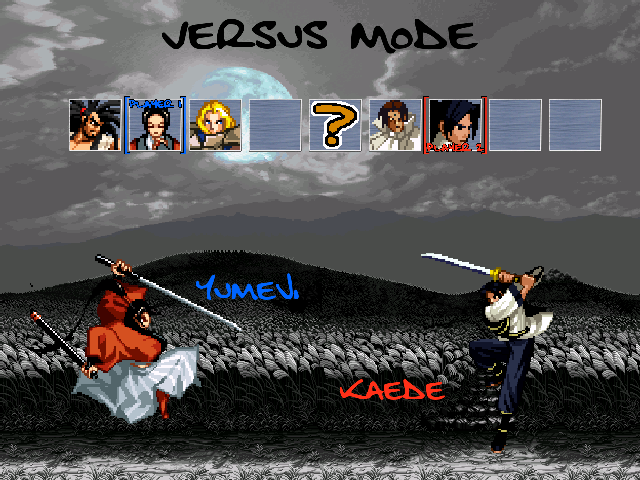 Based off the standard Mugen 1.0 files, it was the perfect opportunity for me to dig into most Mugen creation process : gameplay design, some spriting work, coding stuff, screenpack assets, sound & visual effects etc. 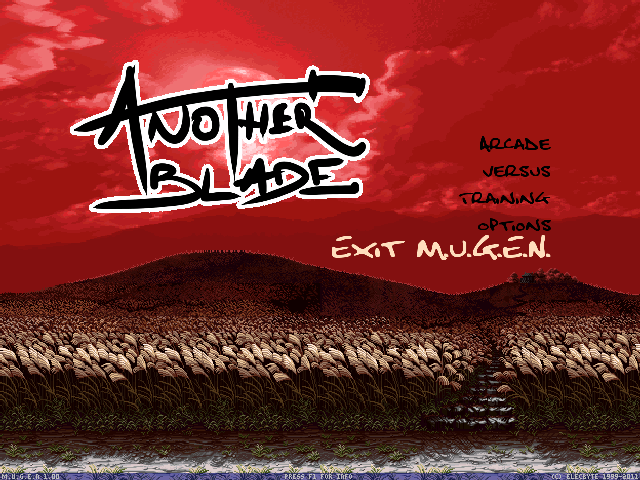 At first, the main idea was not to push Mugen into it's deepest mechanics, but rather to produce an enjoyable game out of my learning process. 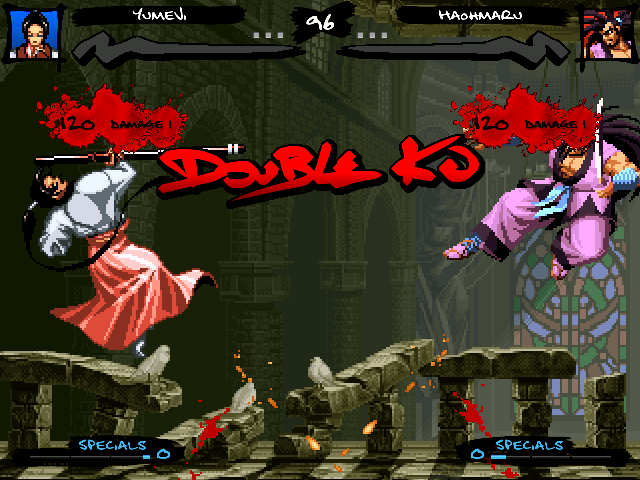 It took me nearly a full year of experimentations before I felt I handle Mugen's basic mechanics enough, and that I had some kind of basis I could start from. For the roster, I'll go straight to the point : I'm a Samurai Shodown and Last Blade fan. I do love the idea that a character is defined to some point by his weapon. The first goal I'm aiming to : 8 characters from those 2 SNK series. Every character has his moveset revamped and adapted into Another Blade's mechanics. Those 8 will let me have the basic stereotypes with a full moveset. I want to experiment things on them, and have a basis for other characters to come. There are many more characters from those 2 series I'd love to implement, but there are also characters from other games that could fit pretty well in Another Blade's universe too . I'll let you guys get involved into the process and call your help to suggest your favorite armed characters. It will definitely help me to chose . A special mention goes to @ExL who already came out with many ideas. I'm not forgetting you mate ! grounded combos, 6 juggle points (could change), and OTG attacks. The main idea I want to develop is a non-special heavy gameplay, and a huge effort in roster balance (I do what I can). Currently, characters have 2 special moves (could change to 3), and depend on the "Special" meter to be able to use them. Supers/Hyper attacks and mechanics are still not defined. I have some preferences but I won't be rushing this out, and I feel this topic is worth being discussed with you players. Combined with the original soundtracks made by Jag24Music (a friend of mine), it adds some kind of 90's hip-hop flavour into it. I'll be doing my best to keep the Ikemen version playable and troubleshoot the most basic stuff, but I can't promise that both engines will behave exactly the same. I hope you guys will enjoy it all. Long time no see ... but I'm still around ! Last few months have been quite rough (new job, new flat etc.) and I've had too little spare time. But I've been preparing some new stuff, and there will be new stuff incoming ! Not sure how long it will take, but I believe it's gonna be worth it. In the first place, I really wanted to make original characters. But as sprite work seemed too huge for me, I've started with sprites from existing characters and experimenting stuff with Mugen engine and learning FighterFactory tricks. Lately, a friend of mine explained me some animation process he uses in his everyday work (he uses AfterEffect from the Adobe collection). He took some time to see what Mugen process is about, so we've figured out a potential process which would help me in spriting work. I'm still not sure if I'll be using AfterEffect or Synfig Studio (a free animation software) , but it did encourage me in drawing my own characters. In addition to that, as Mugen 1.1 handles higher resolutions, and as VirtuallTek is about to release a new version of FighterFactory, I've already started sketching some assets for future spriting and animation process. I will go in details of all that stuff in the near future. But as it's mostly WIP now, I'll post that stuff in the Project section first.